I see Acadiana as Louisiana's home to some of our state's most beloved bon vivants! A people who love their food, their cafe-au-lait colored bayous, cajun music and sharing wild and vivid stories. Click image below to see my listings in Acadiana. Acadiana, or The Heart of Acadiana (French and Cajun French: L'Acadiane), is the official name given to the French Louisiana region that is home to a large Francophone population. Many are of Acadian descent and are now identified as Cajun. 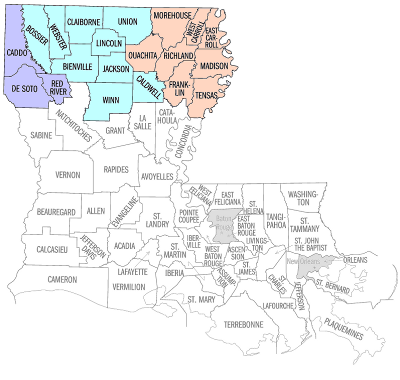 Of the 64 parishes that make up the U.S. state of Louisiana, 22 named parishes and other parishes of similar cultural environment make up this intrastate region. KATC television in Lafayette independently coined "Acadiana" in the early 1960s, giving it a new, broader meaning, and popularized it throughout south Louisiana. Founded in 1962, KATC was owned by the Acadian Television Corporation. In early 1963, the ABC affiliate received an invoice erroneously addressed to the Acadiana Television Corp. Someone had typed an extra "a" at the end of the word "Acadian." The station started using it to describe the region covered by its broadcast signal. Click image below to see my listings in North Louisiana. "Northern Louisiana, also known as the "Sportsman's Paradise" region, comprises the portion of Louisiana north of Sabine, Natchitoches, Grant, LaSalle, Catahoula, and Concordia Parishes. Bordered by Texas to west, Arkansas to the north, and Mississippi to the east, this region of Louisiana has a far more rural feel to it than the Acadiana region or southeastern Louisiana. ​This area of Louisiana has become more renowned in recent times due to the popularity of the television show "Duck Dynasty," in addition to movies that often use towns in north Louisiana as a backdrop. Another claim to fame for this region is the Air Force base around Bossier City and its status as a backup landing location for the President's jet, Air Force One. Landscapes vary drastically compared to the southern portion of the state. Bayous and swamps are replaced with rolling hills and pine forests in the northwestern areas around Shreveport and Mansfield, while open farmland, rivers, and lakes cover the north central and northeastern areas near Ruston, Monroe, Columbia, and Winnsboro. Click image below to see my listings in Southeastern Louisiana. Image courtesy of Tulane New Wave. 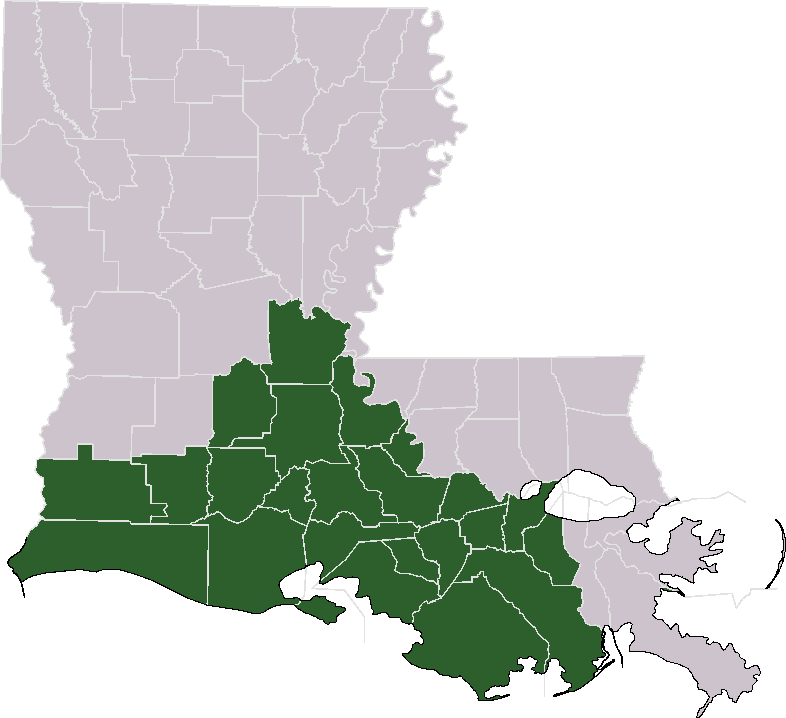 The Greater New Orleans area, Baton Rouge area and SW Parishes along the Mississippi border. The latest National Register of Historic Places Travel Itinerary explores 64 historic places that illustrate this region's vivid history where Spanish, African-American, French, Anglo-American and other cultures met to produce one of the most interesting stories in the United States. Explore the History and Culture of Southeastern Louisiana offers numerous ways to discover the historic properties that played important roles in Louisiana's past. Each property features a brief description of the place's significance, color and historic photographs, and public accessibility information. At the bottom of each page the visitor will also find a navigation bar containing links to three essays that explain more about The River Road, the French Creole Architecture, and the Florida Parishes. These essays provide historical background, or "contexts," for many of the places included in the itinerary. The itinerary can be viewed online, or printed out if you plan to visit Southeastern Louisiana in person. Read more on the National Park Service website.